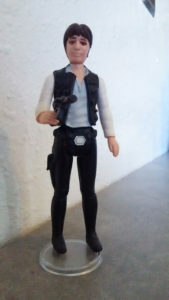 Today’s entry in my “Countdown to Solo” is the vintage Kenner “Large Head” Han Solo action figure. Originally, the figure was issued with a smaller head sculpt (see yesterday’s post) but early in the run Kenner re-sculpted the head on the figure. I’ve heard different reasons as to why, one being that the original sculpt was broken too easily, the second being that they were trying for a better likeness of Harrison Ford (personally, I think the small-head version looks better).